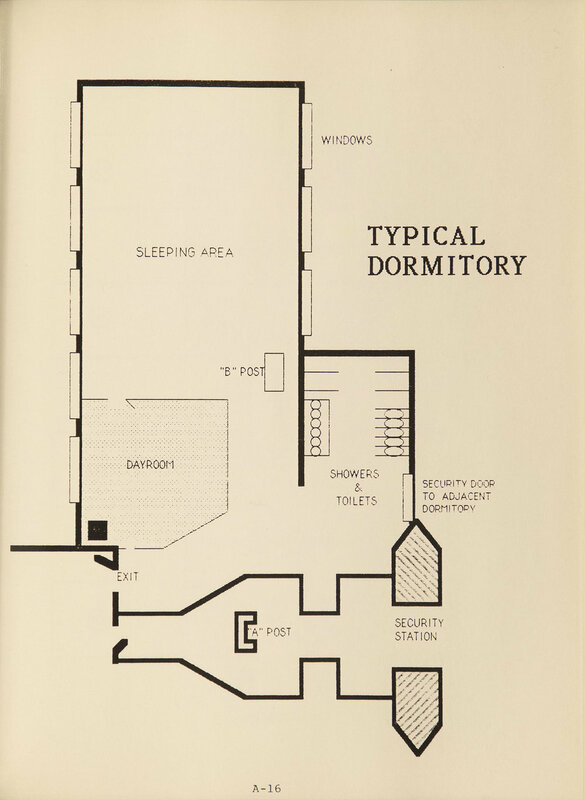 The Mayor Fiorello LaGuardia collection contains several folders detailing the work of the Mayor’s Commission on Conditions in Harlem after the 1935 one-day riot. 256 West 125 Street, ca. 1939. The 1935 riot was sparked by an incident at this Kress department store. Department of Finance Collection, NYC Municipal Archives. On March 19, 1935 a young man was temporarily detained at a Harlem store for shoplifting a knife. A small crowd gathered. Rumors spread that he had been beaten to death in a back room, although in truth he was released out a side door. Communist organizers gave out leaflets tying the incident to broader discrimination against Harlem residents. The crowd grew. A hearse passed by. Rumors flew. One window was broken, then another and soon a melee ensued that continued for most of the evening. Three black men were killed, including another young man who was returning from the movies. More than 100 men were arrested; at least 100 people sustained wounds, chiefly from falling glass and thrown objects; and 250 stores had sustained damage. The next day numerous organizations—many affiliated with the Communist Party—the Fur Workers Industrial Union, Industrial Labor Defense, Branch 41 of the United Councils of Working Class Women, the Alteration Painters Union, the Office Workers Union, the Working People of Amboy and Pitkin, sent telegrams denouncing the violence. The telegram below is only one of several sent on behalf 100, 500, 200 workers gathered at intersections and apparently participating in marches against the violence. 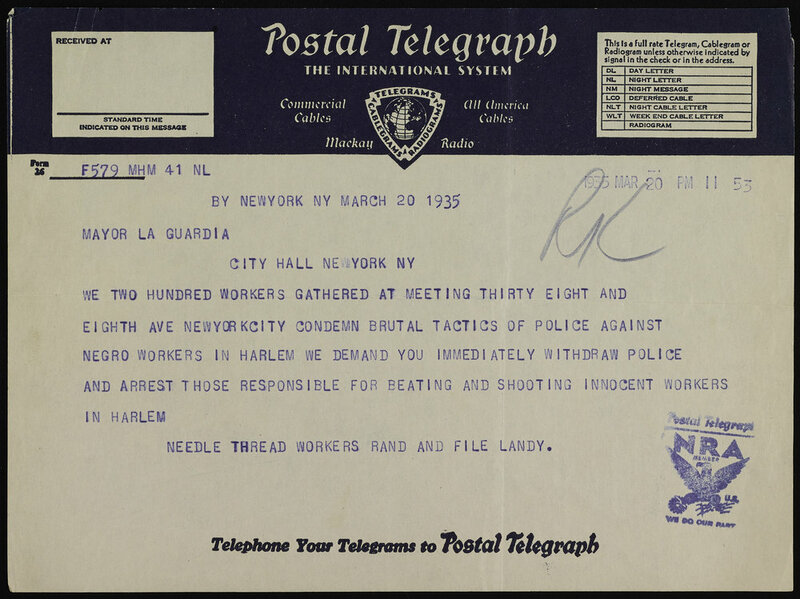 Telegram sent by protesters from the Needle Thread Workers. (The NRA stamp is for the Federal National Recovery Act, not the National Rifle Association.) Mayor LaGuardia Collection, NYC Municipal Archives. Telegram from Walter White of the NAACP urging the forming of a citizens committee to investigate conditions in Harlem in order to prevent further trouble. Mayor LaGuardia Collection, NYC Municipal Archives. Some played the blame game citing communist incitement and invoking racial and ethnic stereotypes. On the other hand, Mayor Fiorello LaGuardia appeared to have heeded White’s recommendation and established a high-level commission to explore the events, examine conditions that contributed to the violence and recommend strategies that might prevent another occurrence. He made a radio appeal to the People of New York City and issued a handout. Mayor LaGuardia’s appeal to “the People of New York City” the day after the 1935 Harlem Riot. Mayor LaGuardia Collection, NYC Municipal Archives. Letter from Walter White of the NAACP laying out the proposed investigation questions the committee should follow. Mayor LaGuardia Collection, NYC Municipal Archives. The Commission established six subcommittees: Crime and the Police, Education, Housing, Discrimination in Employment, Health and Hospitalization and Relief. The subcommittees held hearings, gathered personal testimony, analyzed budgets, and tracked employment statistics. Their work was complicated by the refusal of several officials to participate. For many, the Commission offered an opportunity to present grievances and suggest solutions, as shown by correspondence in the files. One hundred and sixty witnesses testified at the 21 public and four closed hearings. The Commission invited “persons representing all stratas of the population of Harlem. Anyone who had a complaint against any public official… any laborer at the most menial occupation, etc., was given the same opportunity to express himself… as was the most powerful representatives of private or public interest. The historically black sorority Alpha Kappa Alpha, founded in 1908, circulated a resolution that was submitted by several organizations opposing discrimination against black student nurses and dieticians. The two largest, best-equipped training hospitals, Bellevue and Kings County hospital, denied admission to black student nurses. 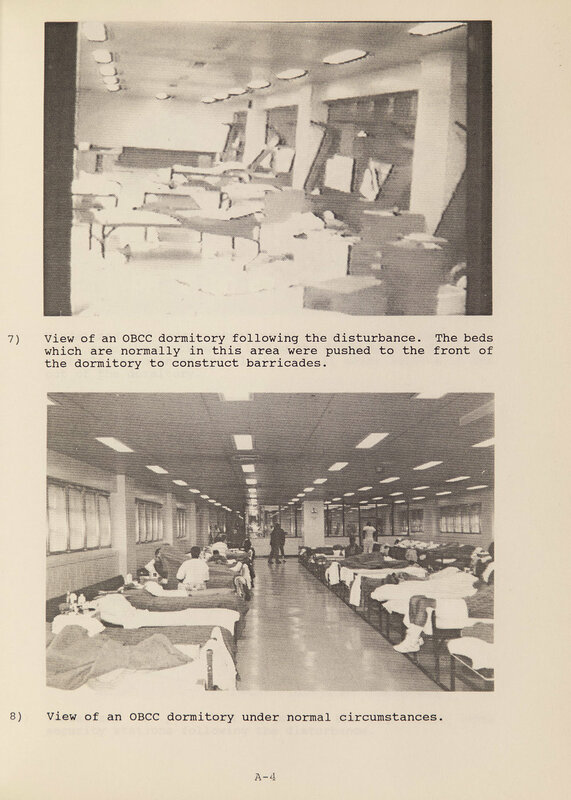 The black trainees were only admitted to Harlem and Lincoln Hospitals and then, upon graduation, were employed at only four of the twenty-nine City hospitals. 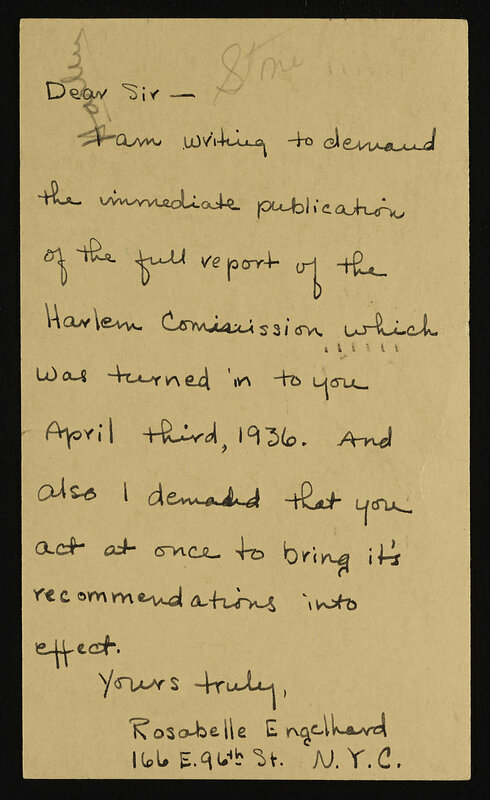 Letter from Adam Clayton Powell to the commission. Mayor LaGuardia Collection, NYC Municipal Archives. Pastor Adam Clayton Powell of the Abyssinian Baptist Church wrote Hays a letter describing another violent incident between a police officer and a black man standing on a breadline. Approximately one year after the riot, the Commission submitted its report to the Mayor. And then? Sections were circulated to department heads for comments. Comments were received. Various people asked for copies. The New York Post (then with a different editorial view than today) and The Daily Worker, issued by the Communist Party, both published sections of the report. Mayor LaGuardia Collection, NYC Municipal Archives. Every chapter presented an indictment of how the City was serving the 200,000 black residents of Harlem. The report also listed dozens of steps that could help remedy the conditions. City government never issued the report. Some recommendations were partially implemented—new schools and a federally-funded health center. LaGuardia appointed black judges and executive staff. In 1946, riots again broke out in Harlem, with the underlying causes very similar to the events of 1935. Overcrowded housing, unequal employment opportunities, a strong sense that justice was lacking. There was greater destruction. More people were killed and wounded. If the recommendations issued a decade earlier had been fully, or even more completely implemented, what would have happened? In 1969, during another period of urban unrest, Arno Press published the full text of the report. 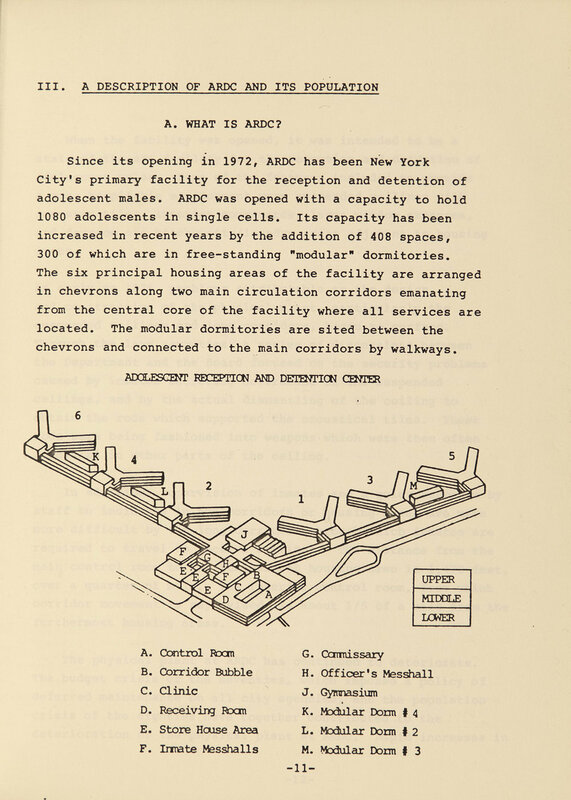 The Municipal Archives has now digitized the report. It is available at the pop-up exhibit at 31 Chambers this week and will be available to readers online in the near future.